Latest entries at top. For first entry click here. Yesterday I discovered another set of eagles on Broadway. It was a beautiful day with low humidity, a nice break from the heat wave of last week when it hit 100 degrees. 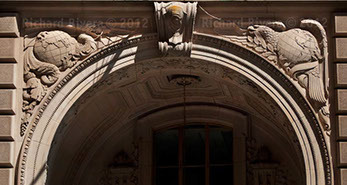 But the new eagles I found are at 71 Broadway, the building south of Trinity Church. Four of them, approximately four feet high, on the second floor ledge. I guess I had not seen them due to the scaffolding across the entire front. 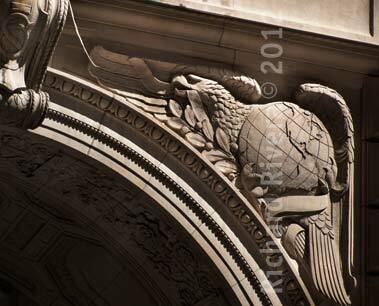 The eagles at the Equitable remain problematic too, also in part to scaffolding that shrouds the arched entrance. That, and the required positioning across the way at Thames Street, which is as narrow as an alley, makes it virtually impossible to get a good photograph. On the fourth-floor level, there are two bas-relief eagles, one at either end of an unfurled scroll, that are quite lovely. 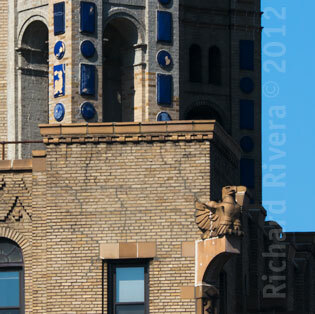 And high above these, on the sixth floor level, there is a flagpole-supporting crest and four sculptured eagles. The main challenge in photographing the top eagles are the time of day, the lower ones are easy as long as you don’t show the entrance. Today was a really good day for photographing the eagles. Low humidity, not as hot for a New York July, and really clear skies. 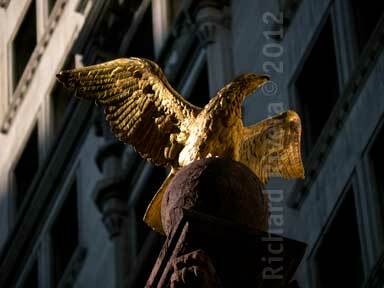 It was a productive day because I wound up photographing the flagpole base eagles on the Equitable Building at 120 Broadway, the Trinity Church Building entrance near Pine Street, the Trinity monument (to those that died as prisoners of war’s during the Revolutionary War), which is in the graveyard at Pine and Broadway; and the eagles at 26 Broadway and Bowling Green. 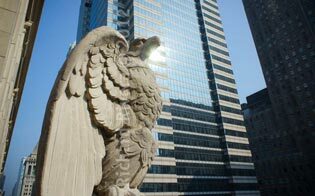 The highly polished eagle at the entrance to 100 Broadway between Pine and Wall streets was a nice accidental discovery. It’s been an interesting process trying to photograph some of these eagles. The biggest difficulty has been trying to find the right time of day, meaning the right lighting (with or without cloud cover), and the right position in order to achieve the proper perspective. One of the decisions that went into that accomplishing those things was buying a new lens because the zoom lens I was using was not long enough. 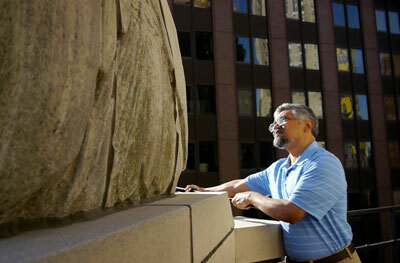 That is the nature of photographing sculptures in places that are essentially inaccessible. I had been shooting with a Panasonic Lumix 45-200mm zoom on the Olympus E-P2, a micro-four-thirds format camera (the crop factor of which makes the lens equivalent to a 90-400mm). Previous experience made it frustratingly clear to me that the lens did not have the reach I needed. So after a lot of research I wound up buying the Panasonic Lumix 100-300mm f.4 zoom (which translates into a 200-600mm!). And it turned out to be really useful today in getting some of the angles and details! 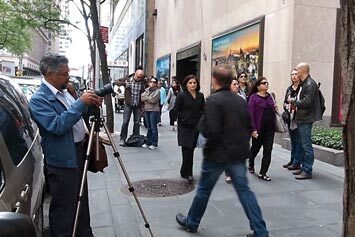 Of course with photography everything is a trade-off. And one of the issues I ran into was that while up to this point I had shot everything handheld with the 45-200mm, the longer focal length introduced different considerations that had to be taken into account. Even though the 100-300mm is image-stabilized, I had to be very careful in bracing myself while shooting because I did not want to shoot wide-open (at the maximum aperture) for most of the shots. Stopping-down and using a smaller aperture, of even one or two full stops, can enhance the performance of optics markedly. It usually eliminates vignetting (darkened corners), increases contrast, color, and sharpness. Often, I wanted to stop-down for greater depth-of-field, which meant a decrease in shutter speed, and meant a greater likelihood for camera-shake and blurriness that in turn diminishes sharpness. Dramatically increasing the ISO to maintain a high shutter speed generally means an increase in “noise” or graininess. Not an appealing alternative. So all those things become factors to consider when you shoot outdoors. The weather, the kind of light, the wind, the season, and the people—like someone bumping into you as you stand on the sidewalk in New York. I went down to photograph the Federal Office Building for the third time. Previously I’d photographed it in early morning light from Barclay Street, along Church Street, and also from West Broadway. This time I thought the sun’s light from a different angle in the late afternoon would work better, and I had a preconceived idea as to where to photograph it from, as well as position and scale. I shot some of those pictures and then moved further back to flatten out the perspective with a longer lens. After I’d finished I was intrigued into photographing the sky between the Federal Office Building and the glass-walled building across the park. 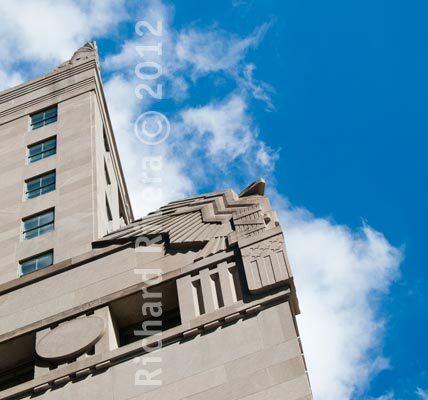 As I was photographing the sky, in a moment more intuitive than planned, I realized that the Federal Office Building eagle would look great if I photographed it from a more extreme angle below, with lots of sky behind it. Plus there were really good clouds and a clear sky. So that’s what I did. 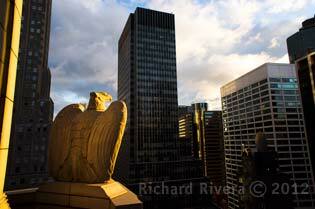 The eagle itself is so angular and abstract that it makes a good fit with the angularity of the composition. And I think that’s probably one of the more successful interpretations of that eagle. I haven’t shot anything in a several days because of the temperatures hovering at 100 degrees here in New York with humidity at 75%. It’s been brutally hot. 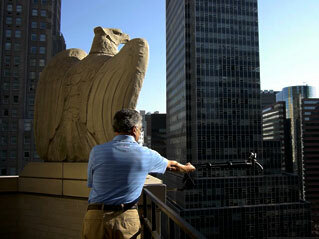 Photographing the eagles on my girlfriend’s terrace presented a real challenge. They are amazing stone sculptures approximately four feet high and mounted on a four foot high wall—they tower over you. I had tried shooting them from the terrace proper but knew that the photos would be somewhat boring because of the fact that the eagles are facing outwards at an angle from the corner, so all you really get a good view of is its back or a slight profile. Some days later I bought a wireless shutter remote for the Sony NEX-5 and this time mounted the camera on my super-light Manfrotto tripod, held it out by the fully extended legs. With the camera attached and held way out over Pearl Street, I asked my girlfriend to fire the remote once I got into position. That gave better results, but not quite what I was looking for. I could not see the LCD screen and had to rely on her for composition—essentially telling me whether the camera was properly aimed. We also ran into a problem because the remote is line-of-sight. And at the shooting angle it was being held, the lens effectively blocked the infrared sensor. Which meant that sometimes she wound up in the photos because she had to get so close to trigger the camera. We had a good laugh over that one, although a frustrated one. Then yesterday morning I shot it again. This time I extended the tripod’s head out a bit further, by about 12 inches, and I used the camera’s 10-second self-timer delay to trigger it. So I would pre-focus, trigger the shutter release, and have ten seconds to position/aim the camera six feet in the air while hugging the railing. And after several tries it worked! And I was lucky enough to be able to capture the sun’s reflection in the building in the background! They are the best shots I’ve ever gotten of the eagle at the corner of Wall and Pearl. 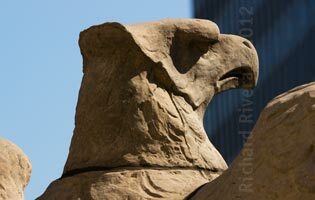 The eagle can be easily seen from the street, and even clearer from Water Street. So, if anyone would have happened to look up they could have seen me doing it. Point at yellow dot to see the dragon. The arched entrance of 26 Broadway.